Historically, in generating material for clinical testing during antibody process development, emphasis was placed on efficacy, product quality, regulatory compliance, and speed. As the biopharmaceutical industry has matured (and with increasing competition), emphasis has shifted toward cost optimization and manufacturability. Reducing the costs of medicines for patients and payers (thereby broadening access to drugs) is now a key driver during development of new therapies as well as modernizing processes for existing molecules. Cost reduction includes providing robust manufacturing processes that can be agile, transferable to multiple production locations around the world, and sufficiently flexible to accept next-generation technologies and processes while ensuring product quality without retrofitting. Cost pressures are not only related to manufacturing, but also to clinical risk and attrition rates for therapeutic candidates progressing through clinical trials. Pressure is also increasing for companies to shorten development times and progress rapidly to first-in-human studies that establish product efficacy. These pressures are forcing the biopharmaceutical industry to consider a right-first-time approach to minimize the iterations of development. In such a paradigm, application of innovative technologies has the most potential to improve cost outcomes. As products move along their clinical and development pathways, however, the opportunity for their sponsors to make process changes diminishes. Produce results that are easily compared and comprehensibly visualized. Assessing new technology trends — including continuous processes, modular facilities, and single-use (SU) technologies — for a particular product at different scales can be a challenge. Can a harmonized approach be adopted both within a company and externally to communicate to the wider industry, spanning end-users and suppliers? 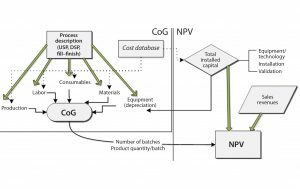 By building on the concepts of process knowledge, we review approaches based on cost of goods (CoG) models with BioSolve Process software from Biopharm Services and use the results to examine capacity impacts using net present cost (NPC) approaches. Most cost models draw on principles of financial and management accounting to assess the cost impact of different investment and operating decisions. Of the different methodologies — net present value (NPV), return on investment (RoI), and so on — CoG is by far the most commonly used model. Gaining better insight into the key cost drivers of a manufacturing process requires a robust, well-structured economic model that measures the sensitivity of overall CoG to changes in key process parameters (e.g., product titers and step yields) (1). Not only CoG should be used when companies need to understand the interplay between expenditures, timing, and project risk. NPV or RoI methodologies are typically better techniques for analyzing alternative technologies and manufacturing strategies because they can account for the impact of delays in expenditures and properly account for the time value of money (2). If no profits are accounted during NPV calculation (because of a lack of sales revenue), the negative NPV value that results is interpreted as the net present cost (NPC). NPC can be used like NPV to evaluate different manufacturing approaches and technologies across the product lifecycle while accounting for initial capital investment, operating costs, and the amount of product generated per year or per batch. If a company is considering a number of process technologies, then the option with the lowest NPC value will be the most favorable financial option. Focus on Monoclonal Antibody (MAb) Manufacturing: MAb expression in mammalian cell hosts has increased dramatically, now frequently reaching titers of 3–5 g/L (3). During the past 10 years, a strong industry focus on upstream process optimization has resulted in a 10- to 100-fold increase in productivity. Based on current trends, future fed-batch titers could further increase to 10–15 g/L. As a result, industry attention is shifting toward technologies that could improve the productivity of downstream purification processes. The most promising new technologies to respond to those needs are SU systems that support higher throughput and reduced chromatography resin use. Examples include continuously fed multicolumn methods using disposable columns — e.g., simulated moving-bed chromatography (SMB) (4) — and novel membrane chromatography technologies (5). SU technologies offer the advantages of low capital cost, allowing for reduced initial investment and distribution of variable cost expenditures across a product’s lifecycle (6). Increased expenditures on consumables is balanced by a flexibility for rapid response to varying market demand. That is becoming increasingly important as drug pipelines transition from traditional MAbs with average demands of 250 kg/yr to heterogeneous portfolios including fusion proteins, nanobodies, and bispecifics with wider demand ranges such as 50–500 kg/yr. SU technologies supporting continuous manufacturing (e.g., perfusion bioreactor production and membrane chromatography systems) combine the advantages of improved process performances and flexible manufacturing with a reduced footprint. A companies process for choosing between different technologies depends on its strategic focus, financial benefits, and feasibility studies undertaken case by case. A quantitative understanding of potential financial benefits is critical to guiding decision makers toward evaluating and developing the right technology options for implementation in manufacturing. Here, BioSolve Process software is used as a framework to quantify potential financial benefits of platforms and process technologies by analyzing both CoG and NPC. 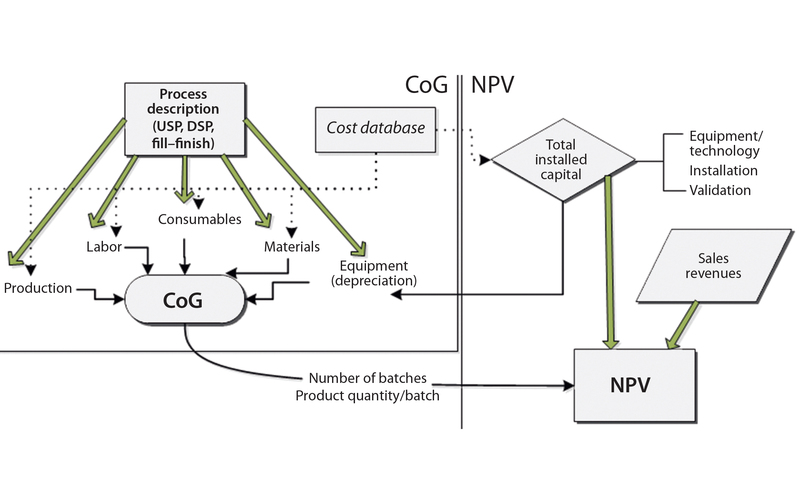 Figure 1 shows the model configuration, and the relationship among different cost components that constitute overall production costs (e.g., capital, materials, consumables, and labor) and NPV analysis (e.g., capital investment and sales revenue). BioSolve Process modeling provides a standardized methodology for cost estimation, including a capital and operating cost database, so we used it as a foundational tool to compare different technology options. The following case studies provide example results. The three case studies presented below focus on cost analysis of new process technologies compared with current traditional Chinese hamster ovary (CHO) MAb production platforms. A joint team including company representatives from research and development (R&D), manufacturing, engineering services, and finance groups worked to develop initial assumptions for the new platform options. The approach we took for this evaluation was to assess initial technology suitability for driving financial benefits (by CoG/NPC analysis) to an existing production platform. We assessed the new models using a network-server approach that allowed crossdivisional groups to use the same harmonized BioSolve Process cost model (process description and cost database) for each production platform option. Supporting such analysis in the early phases of technology evaluation helped us prioritize and focus key parameters for process development. For NPV analysis, we applied standard tax, inflation, discount, and interest rates as well as a 20-year operational lifetime for the facility. We calculated NPV using Equations 1 and 2, in which Rt is the net revenue during a period t (in the case of NPC, this equates to the sum of all new capital expenditures and operating costs in a time period t expressed in present dollars minus the tax benefit of existing capital depreciation), i is the discount rate, and D is depreciation. For NPC, US$0 revenues are accrued through biotherapeutics sales whereas labor, consumables, and utility costs are incorporated. 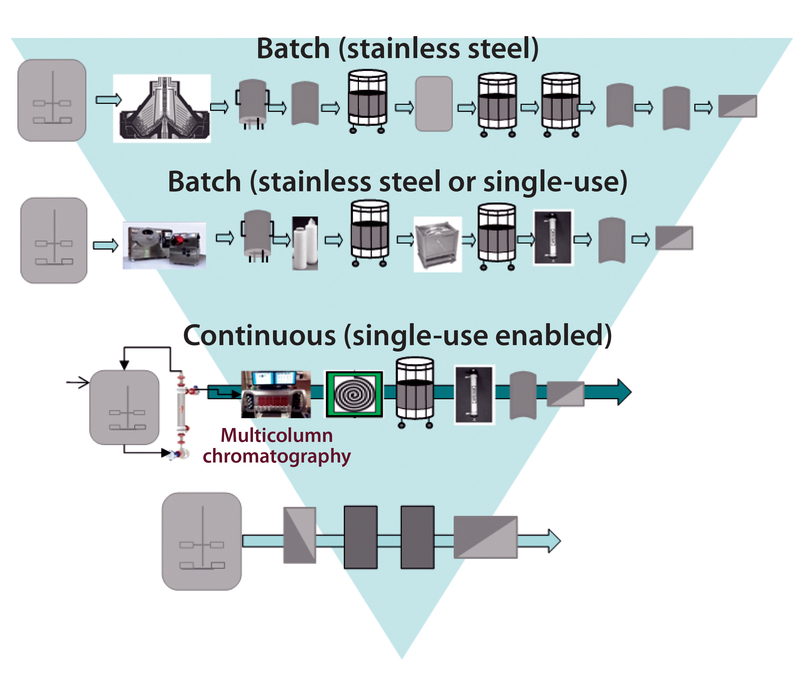 Figure 2: Building a toolbox of CHO MAb flexible production platforms; shaded area depicts increasing intensification from the batch stainless steel processing of today, to the next-generation continuous processes currently under evaluation, to the further intensified processes of the future, with fewer unit operations. Case Study 1 — Process Platform for CHO Culture (Comparing Conventional Stainless Steel and Next-Generation SU Technology Options): We used BioSolve Process software as a foundational tool to compare conventional stainless steel equipment with flexible process options designed for implementing into a low-cost, agile modular “facility of the future.” The next-generation SU platforms we considered included batch processing, intensified SU processing with higher titers (>10 g/L), and fully continuous processing (Figure 2). The traditional MAb manufacturing process used for comparison was based on a facility with 6 × 15,000-L fed-batch bioreactor systems achieving a MAb titer of 3 g/L. SU bioreactors for mammalian cell culture with working volumes ≤2,000 L are a compelling alternative to stainless steel infrastructure as a CHO MAb-production platform. So we considered SU batch and intensified batch processing at the same scale of operation (6 × 2,000-L SU fed-batch bioreactors) but handling MAb titers of 3 g/L and 10 g/L, respectively. An intensified batch process connects an ultrafiltration membrane to a bioreactor to retain both cells and expressed protein over the course of a batch with perfused media. Fresh medium is exchanged, in this case at a base rate of 0.5 bioreactor volumes per day (VVD) after a four-day initial batch growth period. By retaining product in the bioreactor and supporting higher cell densities with the fresh media exchange, titers 3–4× that of standard fed-batch processes have been achieved (7). In our analysis, each fed-batch or intensified batch was processed individually through a batch downstream purification train. Given the potential for high throughputs with reduced modular facility footprints, we also evaluated the use of fully continuous operations. Fully continuous bioreactor production uses microfiltration cell retention on a bioreactor, which allows expressed product to pass through a membrane. Fresh medium is exchanged, in this case at a base rate of 1 VVD after a four-day initial growth period. With cells growing to high density and maintaining high cell-specific productivities with continual harvest, the bioreactor becomes highly productive compared with fed-batch processes harvested only once every 14–21 days. Continuous processing started with perfusion cultivation systems at 2,000-L scale and a MAb productivity of 2 g/L/day over 26 days. That upstream process was connected to integrated purification that included continuous, multicolumn chromatography technology as a key enabler with a single-pass tangential-flow filtration (TFF) module for ultrafiltration. 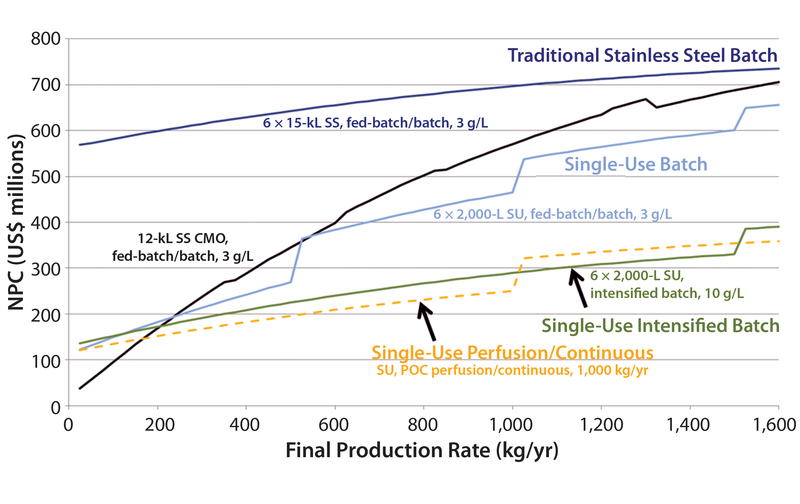 Using consumables such as a bioreactor bag, SU mixing vessels, and SU flow paths in the continuous chromatography unit operation for long durations contributes less to operating costs than short-duration use would. 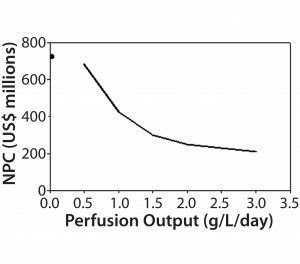 In this case, we combined the output of a single 2,000-L perfusion bioreactor for processing through a single, continuous purification train. A second bioreactor enabled fast turnaround of the processing line. We compared each platform using the same three-column purification chromatography process: protein A (bind and elute) with 35 g/L base loading; anion exchange (flow through) with 100 g/L loading; and cation exchange (bind and elute) with 50 g/L loading). For clarification, we applied either disc-stack centrifugation/depth filtration (for stainless steel facilities), or SU centrifugation/depth filtration (for SU facilities). For bioreactor scales ≤2,000 L, we used SU mixing (≤2,000 L) and storage (≤3,000 L) vessels in addition to 3,000-L stainless steel preparation vessels for buffer and media. For bioreactors >2,000 L, we used stainless steel preparation and hold vessels. 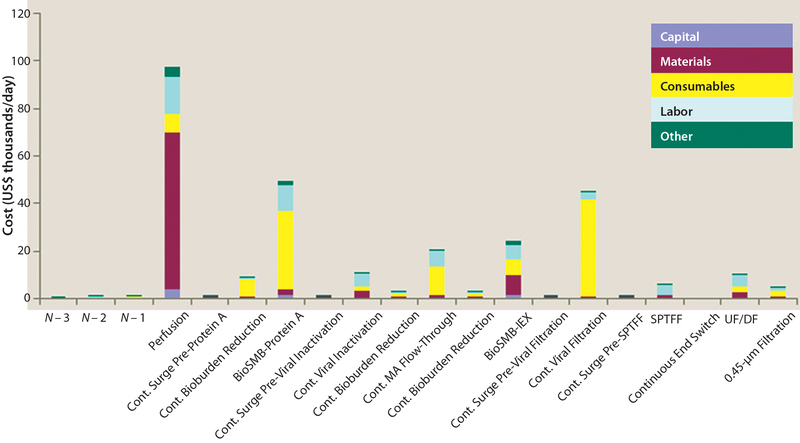 The baseline bioreactor media cost was under $10/L for both fed-batch and perfusion processes. For columns ≤60-cm diameter, we used prepacked columns. We found NPC as a function of final production rate to be an effective way to summarize and compare the different platform configurations (Figure 3) because it encapsulates low and high facility use rates in the same curve. In this analysis, vertical discontinuous jumps indicate the capital needed to build a new facility. For example, a 6 × 2,000-L SU fed-batch facility could manufacture up to ~500 kg/yr before additional capacity would be needed. So a new product was brought to market starting in the fourth year, with annual demands of 250 kg/yr. Facility capital costs become smaller with installed throughput because of inflation over time and the fact that capacity is added later in time and only when needed. Multimillion-dollar cost savings could be achieved by moving from a conventional stainless steel 6 × 15,000-L facility (with an associated NPC ranging $600–700 million) to build smaller SU platforms. It can be noted that the transition to SU facilities operating at similar titers (3 g/L) shifts the NPC curve down significantly for low volumes and tracks very similarly to what would be charged by a contract manufacturing organization (CMO). It is also of note that the slope of the operating line is similar for both cases (15,000-L SS and 2,000-L SU), indicating that the operating costs of those facilities are similar and the majority of savings come from lower capital investment and capital deferral for additional facilities. Next-generation technologies such as high-titer intensified batches (e.g., 10 g/L) and continuous processing provide the most significant cost reductions. For the latter, cost savings stem from a combination of effects such as improved cell line expression, enabling cost-effective perfusion (>2 g/L/day) at 1 VVD, and the benefits of rapid, continuous operations. Productivity and throughput improvements (3–4× faster) were supported by resin reduction from multicolumn chromatography (4), single-pass TFF, novel membranes (5), and elimination of large intermediate-product hold vessels (9). This approach underlay an evolving model designed to assess the relative differences between potential platform approaches. 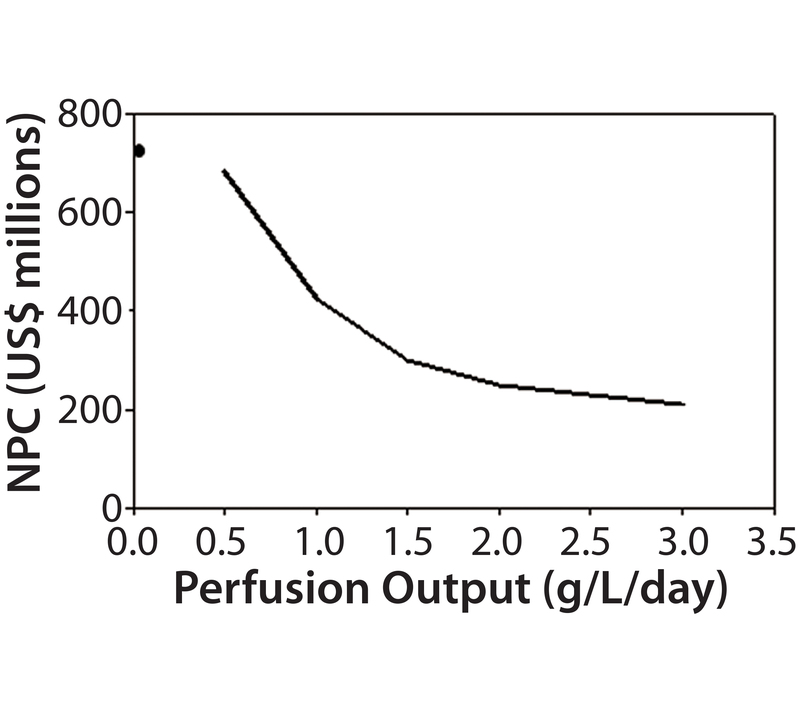 Note that the intensified and perfusion processes have smaller slopes than the stainless and SU facilities, indicating lower operating costs. This may be counterintuitive considering the large expenditure on media in perfused systems. However, that is offset by higher facility productivity and, in the case of the continuous process, a streamlined labor force. We anticipate that absolute values may be achievable with further model evaluation. 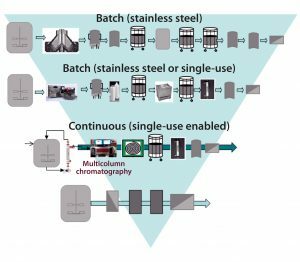 This type of analysis is driving a number of companies to invest in developing continuous processing enabled by SU technology for lower-cost and smaller-footprint facilities based on <500-L upstream scale. Case Study 2 — Perfusion Upstream Processing (Economic Cost and Sensitivity Analysis): Technology advances such as continuous chromatography systems (4, 8, 10) that operate with an uninterrupted feed flow have led to a resurgence of interest in true perfusion bioreactors as tools to enable integration of protein production for complete, end-to-end continuous bioprocessing of biotherapeutics (Figure 4) (9, 11). As presented in the above case study for a set of media and cost assumptions, perfusion bioreactors directly linked to continuous downstream purification trains can be economically favorable technology platforms for therapeutic protein manufacturing. Successful automation of such a process can reduce facility head counts and residence times in individual unit operations, ultimately making protein biomanufacturing more economical through improved control. However, a highly productive perfusion process operating at productivities >2 g/L/day relies on large volumes of media exchange to deliver depleted nutrient components and remove both toxic waste components and expressed protein from the bioreactor with a cell retention device. Initially, we developed a new continuous bioprocessing model in the BioSolve Process platform, starting with 4 × 2,000-L SU perfusion bioreactors through single-pass TFF and a batchwise diafiltration step (Figure 4). Their outputs were pooled and processed together through one continuous purification train downstream. A high-level cost analysis of each individual unit operation from this model is an output of the model. In Figure 5, an example with baseline media use (1 VVD) and cost ($8/L), individual cost components are shown in thousands of dollars per batch and further broken down into capital, materials, consumables, labor, and other categories. Note that the largest cost contributor in this process is material related to perfusion protein production, which is directly proportional to total media cost. 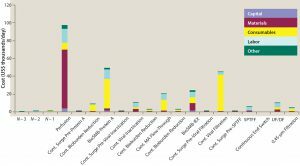 Hence, perfusion media dominate the cost profile above other typical key drivers in a MAb platform, including those associated with consumables from protein A capture chromatography or viral filters. So it is important to understand the effect of media volume use, compounding, permeate titer, and cost to the overall NPV assessment before committing molecules to this new type of technology platform. 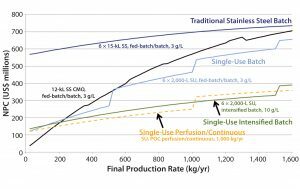 A key question tied to media use is what bioreactor productivity should be targeted to optimize cost value. The answer would be used to drive process development efforts and decisions. The BioSolve Process Sensitivity Analysis tool function can run multiple model iterations with different parameter sets. Users can select any two workbook variables to perform multidimensional sensitivity analysis. For this exercise, we selected a single variable (bioreactor productivity) for analysis over a range of 0.5–3.0 g/L/day at a constant 1-VVD exchange rate. The analysis demonstrates large variability in the region between 0.5 and 1.5 g/L/day (Figure 6). Once productivity reaches >2 g/L/day, however, the slope of NPC/productivity flattens and provides a more favorable cost proposition. A second-dimension analysis varied both productivity and exchange rate using the sensitivity analysis tool varying to find additional operational targets. This again provided useful information to the process development teams. The results for media-exchange rate showed that NPC could be reduced significantly by nearly 50% by lowering perfusion rates from 2 VVD to 0.5 VVD. Although intuitive, this analysis showed that increasing productivity at the expense of larger media-exchange rates would negatively affect process economics. Development teams who had already demonstrated feasibility at 1 g/L/day were hoping to increase productivity with a higher media-exchange rate; however, as a result of this analysis, resources were refocused to double the productivity while limiting that rate to ≤1 VVD. 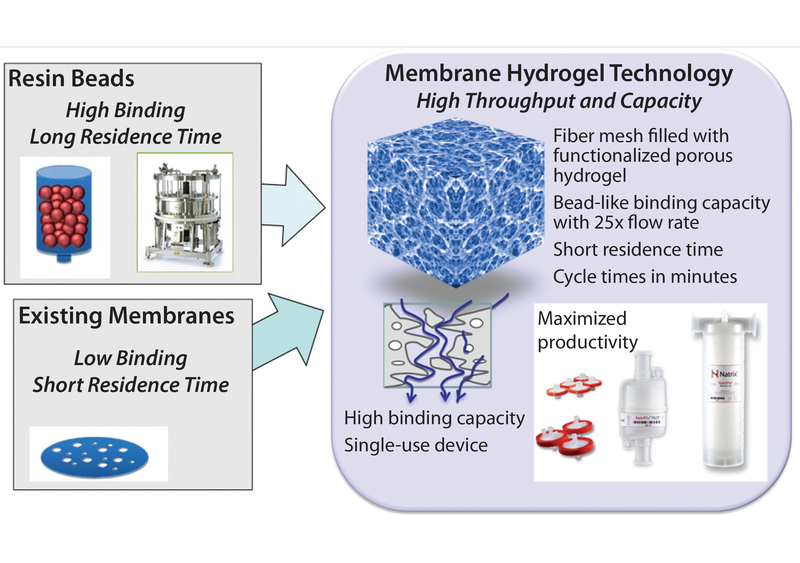 Case Study 3 — Initial Assessment of Potential Cost Benefits of a New Technology (Membrane Hydrogel Capture Step): Purification processing for biologics has traditionally relied on linear processing with low-productivity column adsorption steps because of limited availability of alternative SU technologies. As an alternative to traditional chromatography resins, membrane technology has provided a mechanism to improve throughput and provide a disposable format (12). The larger pore sizes of membrane matrices allow predominately convective mass transport rather than diffusion-limited processes common to liquid chromatography based on resin beads. Membrane chromatography thus operates at higher volumetric flow rates while maintaining constant dynamic binding capacities (DBCs). Recently, further throughput and loading-capacity improvement has been achieved with novel membrane hydrogel technology composed of a porous, functionalized three-dimensional hydrogel (5). Figure 7 compares resin and hydrogel-based chromatography. Based on the SU batch processing of a MAb described in Case Study 1, we developed a new model within the BioSolve Process platform for a bioreactor titer of 5 g/L and a streamlined two-column purification train (omitting the cation-exchange step). This model incorporated assumptions for both capture chromatography using protein A functionalized hydrogels and flow-through polishing chromatography using Q-functionalized anion-exchange hydrogels from Natrix Separations. Proof-of-concept experiments provided a basis for this assessment, with MAb capture using a prototype protein A hydrogel demonstrated to be 25–45 g/L and 6–10 kg/L loading on the Q-functionalized hydrogel. For the capture step, an initial laboratory-scale evaluation showed MAb loading similar to column performance, with a significantly improved residence time (30–60× faster), improved productivity (3×), and favorable impurity removal (Table 2). The anion-exchange step loading is 30–60× greater than the current platform (resin column) loading and has shown equivalent impurity reduction (5). By running in a mostly convective flow regime with low backpressures, a hydrogel can be operated at residence times that are 35–40× faster than conventional resin chromatography can run. Table 1 lists key assumptions for these steps. From the BioSolve Process analysis, by incorporating the Q-functionalized hydrogel alone, facility use can be increased by an additional four to five batches per year over column-based processes. In addition, buffer use in the polishing step was reduced by ≤40× by the increased loading and SU nature of the technology that eliminate postuse flushing and clean-in-place (CIP) steps. Combining a protein A prototype capture hydrogel with a polishing step formed the basis of a significant cost reduction. The disposable device also could provide additional cost savings by reducing cold-storage area for column inventory and eliminating the need for column packing. The combination amounted to significant potential NPC savings ≤40% (Table 2). Although significant process development remains to be completed, this initial cost assessment (executed in parallel with initial laboratory-scale evaluations) supported a decision to proceed with further supporting development into the column-free purification concept. Collaboration Linking Technology Innovators with Biopharmaceutical Research Developers and Manufacturers: Innovation in manufacturing technology is a key component of improving economics and increasing the flexibility and quality of complex biological products (13). Historically, manufacturing technology innovation has been driven by internal programs within supplier companies. Understanding the economic impact of technologies often becomes apparent only after their launch — when users can actually evaluate the technologies in their pilot facilities. That is an inefficient process, however, and leads to development of technologies with little or no understanding of their economic impact. An opportunity thus is missed whereby a technology could be optimized to deliver maximum economic benefit. Here, we have demonstrated the benefits of a standard approach to process economic analysis coupled with a collaborative relationship between manufacturing technology providers and users. This yields an early, in-depth understanding of the economics of manufacturing technologies that have been used to guide development of next-generation manufacturing platforms and assisted suppliers in further improvement of technologies. This is just the beginning of what can be achieved by a collaborative approach using modern cloud-based software. BioSolve software provided a standard approach to defining the process economics that formed the basis of communication between all internal and external stakeholders. With an adaptable framework, it allows users to describe new manufacturing technologies and evaluate the impact on their processes quickly. Share generic models and unit operation technologies collaboratively among all stakeholders (building knowledge). Provide the capability for manufacturing technology innovators to share unit operation models of their novel technologies with the end-user community (improving supply chain efficiencies). To achieve the first objective, Biopharm Services set up a new cloud-based service called BioSolve Central. All BioSolve users thus can gain access to the generic processes and unit operation models by logging onto the service and downloading the manufacturing technologies of interest. The BioSolve Central database currently contains generic processes for MAb, viral, and microbial products, and end-user companies have begun committing to providing their own generic process models (e.g., a Pichia yeast process will be deployed in the short term). Biopharm Services also is using this platform to make the latest generation of continuous unit operation process models available to end users. The second objective is more ambitious. Also cloud-based, the BioSolve Supplier Showcase service will host manufacturing technology innovations from suppliers and make them available to the biopharmaceutical development and manufacturing community. This will host the latest technologies in development or about to be introduced. Biopharm Services is about to launch this service online, where it expects to host some of the latest technologies relating to continuous chromatography, membrane absorbers, and so on. Sharing generic knowledge between organizations and building a knowledge base of standard processes and technologies will help companies reduce risk and enable increased deployment of novel technologies with potentially high economic impact. Harmonization of economic assessments within and between organizations will provide a common framework for decision making. Supply chain integration will provide feedback as novel manufacturing technologies are developed, shaping them to improve their relevance, and speeding their evaluation and implementation to reduce technology transfer time. To date, such a collaborative approach has been demonstrated to deliver real value to all parties involved: software developers, manufacturing technology innovators, biopharmaceutical developers and manufacturers, and academics. Today, biomanufacturing is recognized as a key strategic driver (13). The biopharmaceutical industry is working to develop a flexible and agile production toolbox of options to support scalable operations that deliver high-quality products at a cost that will be at least an order of magnitude lower than it is today. An increasingly heterogeneous product pipeline and variable market demands are driving future manufacturing expansion decisions to consider how facilities of the future will be designed (e.g., incorporating SU technology and high-throughput continuous processing operations). We have demonstrated that two things will be required: better sharing of generic process knowledge among organizations, and improved supply chain efficiency for managing and applying innovative manufacturing technologies. Together with collaborating organizations, we are implementing an approach using BioSolve Process and NPV tools to standardize economic evaluation of processes and manufacturing technology options. During new-technology assessments, undertaking the economic cost assessment in parallel with early laboratory proof of concept studies has proven beneficial to streamlining process development and helping decision-makers focus on key cost-sensitive parameters. New cloud-based services such as BioSolve Central and the BioSolve Supplier Showcase program link new-technology suppliers to end users with tools that enable stakeholders to collaborate, share, integrate, and build process knowledge. This is just the beginning. These concepts need to expand as the industry strives for agile, cost-effective manufacturing to broaden patient access to biotherapeutics in the future. We sincerely thank a number of scientists and engineers from Merck & Co. Inc. who assisted with the case studies, particularly Jeff Johnson and Dave Moyle. We also thank Jim Stout, Gary Skarja, and John Chickosky at Natrix Separations. 1 Sinclair A, Monge M. Measuring Manufacturing Cost and Its Impact on Organizations. BioProcess Int. 8(6) 2010: 10–14. 2 Sinclair A, Monge M. Monoclonal Antibody Manufacturing: Cost Benefits of Hybrid Disposable Systems. BioProcess Int. 9(9) 2011: 12–17. 3 Jagschies G, et al. Technical and Economical Evaluation of Downstream Processing Options for Monoclonal Antibody (MAb) Production. BioPharm Int. 2 June 2006. 4 Bisschops M. Chapter 24: BioSMB™ Technology — Continuous Countercurrent Chromatography Enabling a Fully Disposable Process. Biopharmaceutical Production Technology, Volume 1 and Volume 2. John Wiley & Sons, Inc.: Weinheim, Germany, 2012; doi:10.1002/9783527653096.ch24. 5 Hou Y, et al. Advective Hydrogel Membrane Chromatography for Monoclonal Antibody Purification in Bioprocessing. Biotechnol. Prog. 31(4) 2015: 974–982. 6 Sinclair A, Monge M. Biomanufacturing for the 21st Century: Designing a Concept Facility Based on Single-Use Systems. BioProcess Int. 2(9) 2004: S26–S31. 7 Yang WC, et al. Concentrated Fed-Batch Cell Culture Increases Manufacturing Capacity Without Additional Volumetric Capacity. J. Biotechnol. 217, 2016: 1–11. 8 Bisschops M, Brower M. The Impact of Continuous Multicolumn Chromatography on Biomanufacturing Efficiency. Pharmaceut. Bioproc. 1(4) 2013: 361–372; doi:10.4155/pbp.13.46. 9 Brower M, Hou Y, Pollard D. Continuous Processing in Pharmaceutical Manufacturing. Subramanian G, Ed. Wiley VCH: Weinheim, Germany, 2015: 255–296. 1 Warikoo V, et al. Integrated Continuous Production of Recombinant Therapeutic Proteins. Biotechnol. Bioeng. 109(12) 2012: 3018–3029. 12 Lim JAC, et al. Economic Benefits of Single-Use Membrane Chromatography in Polishing: A Cost of Goods Model. BioProcess Int. 5(2) 2007: 60–64. 13 Jacoby R, et al. Advanced Biopharmaceutical Manufacturing: An Evolution Underway. Deloitte Development: Oakland, CA, 2015. David Pollard is executive director of bioprocess technologies and expression development, and Mark Brower is an associate principal scientist leading the next-generation platform development group of bioprocess technology and expression at Merck & Co. Inc., Kenilworth, NJ. Yuki Abe (y.abe@biopharmservices.com) is a senior consultant engineer and sales and marketing manager; Adriana G. Lopes is a senior bioprocess engineering consultant, and Andrew Sinclair is president and founder of Biopharm Services, Chesham, UK.